Fully Charged Live, the best electric vehicle and clean energy event of the year, is back for 2019, and ticket sales are now open! This year’s event, on 7, 8 & 9 June, will again take place at Silverstone, but will be bigger, better, and even more fun, with over 100 EVs on display, and a new feature this year will be the chance to test drive the latest electric vehicles around Silverstone’s Stowe Circuit. There will also be over a hundred stands where you can find out more about EVs, charging, renewables, and lots more. 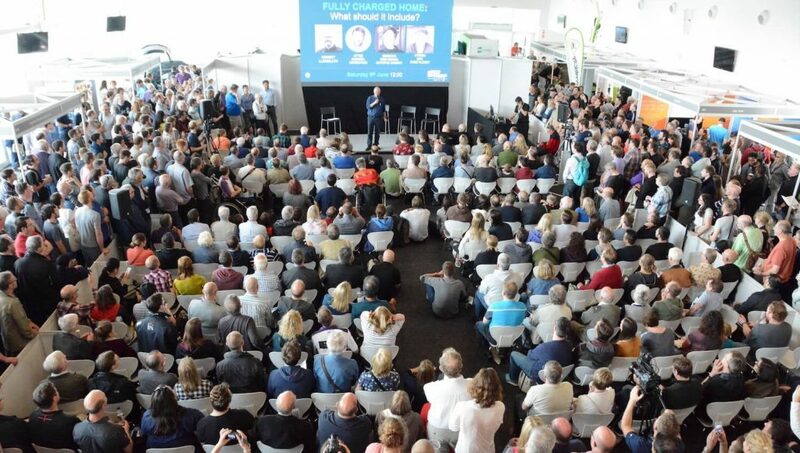 More presentations will be happening on stage, with 30 live sessions across two theatres, with Robert Llewellyn, Jonny Smith and others, and if you were there last year, don’t worry, there’ll be more room for the audience this time! (and an even larger fleet of Teslas will shuttle people to the event from Silverstone’s car park). The extra day, Friday 7 June, will be a ‘Trade Day’, with an industry conference. There will also be a Live Music Stage with live bands throughout, and a set from Robert Llewellyn’s Red Dwarf co-star Craig Charles’ Funk & Soul Club on Saturday. Fully Charged recently released the results from its audience survey (7,700 people), with one of the key findings being that 9 out of 10 electric vehicle drivers would never go back to a petrol or diesel car. Fully Charged has already attracted more than 7 million episode views this year. And a new Fully Charged website is coming soon!